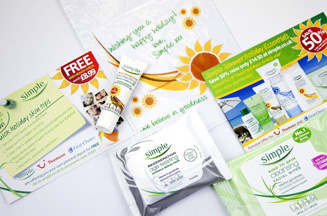 LONDON- Skincare brand Simple has teamed up with Tui Travel to give customers free holiday skincare packs when they exchange currency in First Choice or Thomson outlets. Simple said the pack, worth £25, marks the first time it has forged a promotional partnership on this scale. Customers will be offered the gift when they spend £500 on currency. It contains products including Kind to Skin Cleansing Facial Wipes, Sun Sensitive Protecting Facial Hydrolotion SPF25 and Simple Regeneration Age Resisting Vitamin E Serum Pads. Richard Turner, foreign exchange business development manager for Tui Travel UK & Ireland, said ‘We hope that this incentive will attract customers to the foreign exchange counters as well as help them save money during the current recession'.